OK, I'll admit it: I was sceptical when I saw this title come across my computer screen. "Yeah, right!" I thought to myself. "No way kids will want to read about vegetables." Woo boy, was I wrong. Seriously wrong. But first, the nitty gritty. 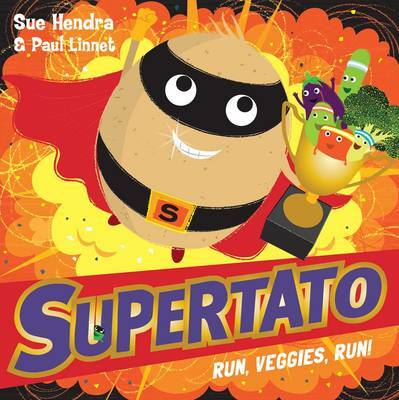 Supertato Veggies Assemble is the latest in the Supertato series by Sue Hendra. The title is pretty self-explanatory; the protagonist is a superhero who is also a potato. And yes, I did love writing that sentence. But I digress. The story takes place in the supermarket that Supertato calls home. It's Sports Day and the veggies are gearing up to compete and win prizes. Everything's going smoothly until the Evil Pea turns up with a mysterious companion, Dorothy, who appears to be a watermelon. A watermelon who manages to win every single contest! But not all is as it seems. Underhanded tricks and sneaky plans are underway! Will Supertato uncover the mischievous plot by Evil Pea and his strange companion? Can he save Sports Day for the rest of the veggies? You'll have to grab a copy to find out! Listen kids, my son loves this book. L-O-V-E-S type of love. He slept next to it the first night after we received it, and my other son (18 months at the time) was engaged enough by Paul Linnet's colourful, vibrant pictures to sit patiently while I read the story (twice through!). So yeah, colour me a Supertato convert.